The Monmouth Constituency has a working age population of around 50,000 (48,600 in 2008), living in the towns, villages and rural areas of Monmouthshire and Torfaen. It is currently represented by a Conservative Member of Parliament. The constituency covers most of the Monmouthshire local authority and a small part of Torfaen County Borough. The constituency is shown in red in the map on the right (click the map to view a larger version). 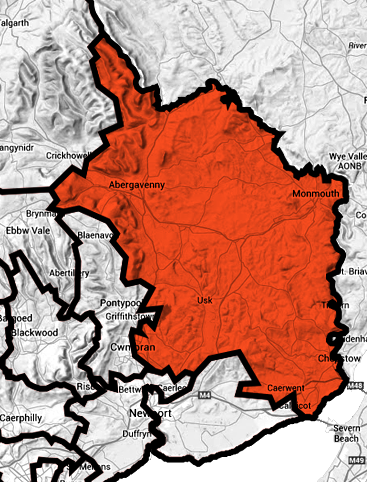 The Monmouth Constituency is often perceived as prosperous – it is less densely populated than other South Wales constituencies with inhabitants who are healthier, wealthier, older, better educated, better housed and more likely to be in full time employment than the Welsh average. However, its residents share the same problems as those elsewhere, as well as some problems which are more intense, such as a local economy over-reliant on poorly paid jobs. The Monmouth Constituency Labour Party wants to look after the interests of all residents, not just the wealthy few. Link to the Wikipedia page about the constituency. It takes over an hour to drive the 45 miles from the very north of the constituency to the Severn crossings at the very south, and over 30 minutes to drive the 25 miles from the east to the west boundaries. 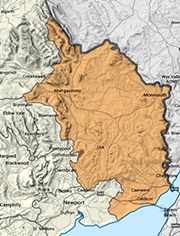 The Monmouth Constituency consists of these Monmouthshire wards: Caerwent, Cantref, Castle, Croesonen, Crucorney, Devauden, Dixton with Osbaston, Drybridge, Goytre Fawr, Grofield, Lansdown, Larkfield, Llanbadoc, Llanelly Hill, Llanfoist Fawr, Llangybi Fawr, Llanover, Llantilio Crossenny, Llanwenarth Ultra, Mardy, Mitchel Troy, Overmonnow, Priory, Raglan, St Arvans, St Christopher’s, St Kingsmark, St Mary’s, Shirenewton, Thornwell, Trellech United, Usk and Wyesham. It also includes these wards within the County Borough of Torfaen: Croesyceiliog North, Croesyceiliog South, Llanyrafon West and Llanyrafon East & Ponthir. Monmouth Constituency wards are grouped together in five branches: Bryn-y-Cwm Branch, Lower Wye Branch, Monmouth Branch, Usk Branch and Afon Lwyd Branch. Contact details are on the Branches and meetings webpage. Branches and other county / constituency bodies meet on a regular basis. There's more information about meetings and the structure of branches, wards and other county / constituency bodies on the Branches and meetings webpage. Follw the links below for details of these elected members and candidates. 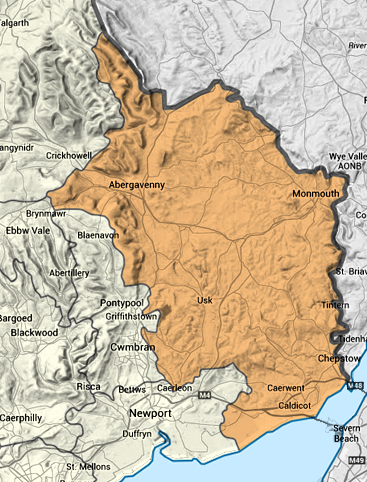 The county of Monmouthshire is not the same as the Monmouth Constituency - the map on the right gives an idea of where the boundaries differ (click map to view a larger version). In addition to the Monmouthshire wards listed above, the county of Monmouthshire includes the following wards which are in the Newport East Constituency: Caldicot Castle, Dewstow, Green Lane, Mill, Rogiet, Severn, The Elms and West End. These wards form the Severside Branch. Details of branches, including contact information and meetings, are on the Branches and meetings webpage. Details of LCF meetings, are on the Branches and meetings webpage.